Your situation will determine which tax form you need to fill out. US persons are required to fill out a W9 form. Non-US individuals will need to fill out a W8BEN form, and non-US corporations will need to fill out a W8BEN-E form. This article is about the W8BEN-E form, we have equivalent articles for W8-BEN and W9. For registered corporation, select A Corporation option. 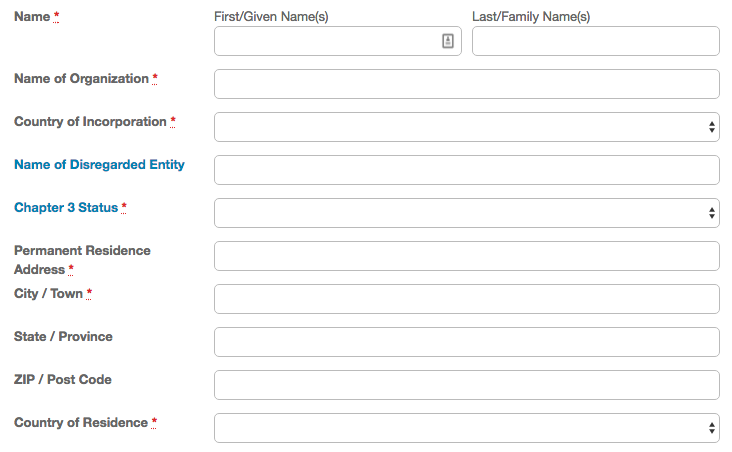 The first section of the form asks for your organisation’s details. In this section, please provide your details including your name, your organisation’s name, country of incorporation and postal address in your country of residence. Please ensure that you provide a complete address because we will use this address to send you a hard copy of your Form 1042, which is your US earnings summary for the year. You’ll also need to specify the name of disregarded entity (if applicable) and chapter 3 status. A disregarded entity is a business that has a single owner and is not a corporation under the US Regulations section 301.7701-2(b). Chapter 3 status refers to, chapter 3 of the US Internal Revenue Code (Withholding of Tax on Nonresident Aliens and Foreign Corporations). Please refer to the IRS instructions for further details https://www.irs.gov/pub/irs-pdf/iw8bene.pdf. For your Chapter 3 status, please select the type that represents your classification (for example, corporation, trust, estate, etc). By selecting a particular type, you are representing that you qualify for the classification indicated. 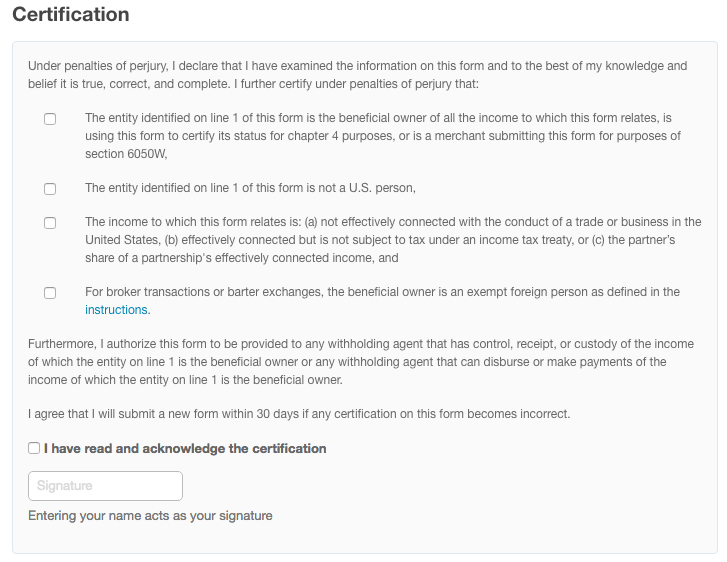 The second section of the form is all about your country’s tax treaty with the US, if any. An entity that is claiming a reduced rate of, or exemption from, withholding under an income tax treaty must confirm the country where the entity is identified as a resident for income tax treaty purposes and check the box to certify that it is a resident of that country. An entity that is claiming a reduced rate of, or exemption from, withholding under an income tax treaty must check the box to certify that it derives the item of income for which the treaty benefit is claimed and meets the limitation of benefits provisions contained in the treaty, if any. If you are a resident of a foreign country that has entered into an income tax treaty with the US that contains a limitation of benefits article, you must select the type of entity that is claiming the treaty benefits. You can read about the different types here. 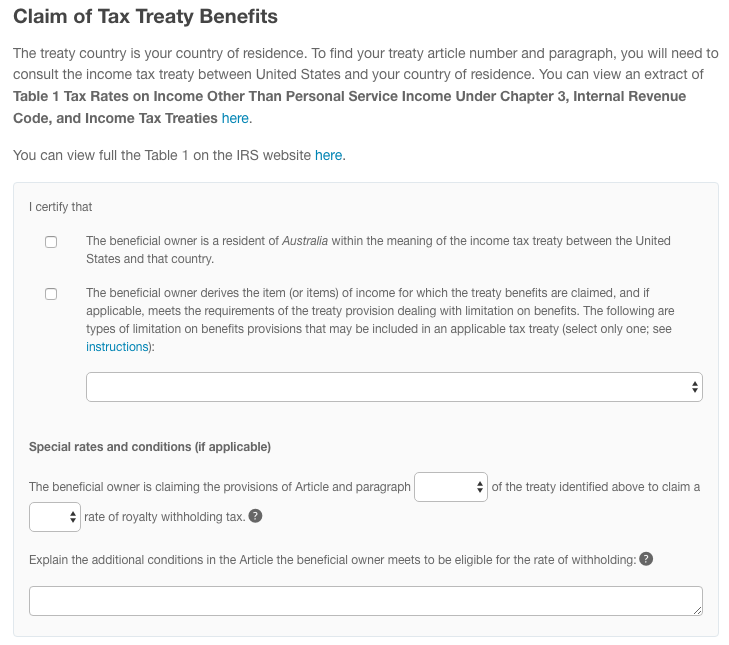 Then if you’re from a country that has a treaty with the US you’ll need to fill out the treaty article number and tax rate relevant to your country. You can find this information in this extract table from the IRS. You can also view the full table on the IRS website. You’ll also need to explain the conditions based on your residency that make you eligible for the rate of withholding specified. If your country is not on this table, that means your country does not have a treaty with the US and if you’re from a country that doesn’t have a treaty with the US you will not have to fill out this part of the form. We’ll make this easy for you by hiding this section. Even if your country does not have a treaty with the US, it is beneficial for you to submit your tax information. 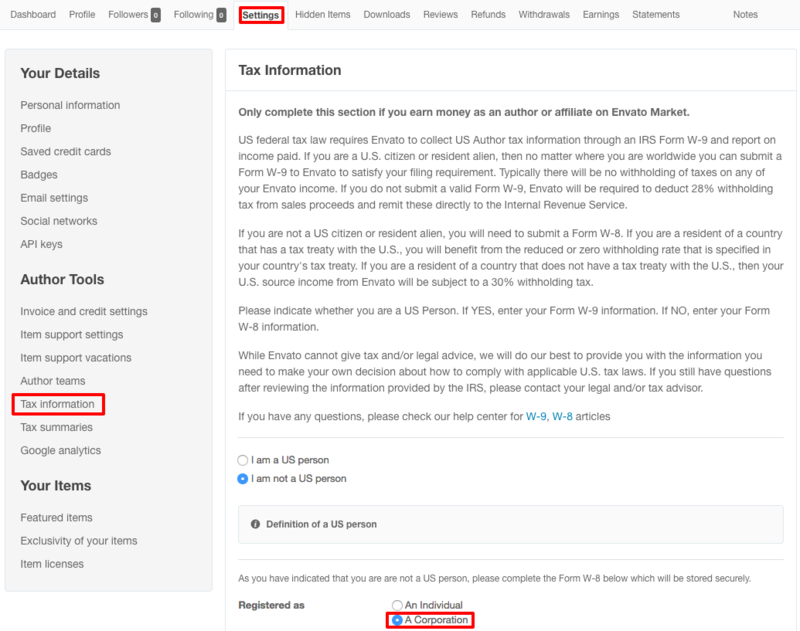 By submitting your tax information, your earnings from non-US customers will not be subject to US taxes. Note, however, that your royalty income from US customers will attract 30% royalty withholding tax. In the final section of the form you’re required to certify the information you’ve provided is correct. Please make sure you understand all the items under this section. The purpose of the Form W8BEN-E is to establish your identity and status as a non-U.S. organisation, that you are the beneficial owner of the revenue and whether a lower rate of withholding applies as the result of a treaty claim. Even if your country does not have a treaty with the US, the form is used to establish that you are not a U.S. organisation. It is important to note that providing false information is subject to penalties under perjury.